Heat oven to 400°F. 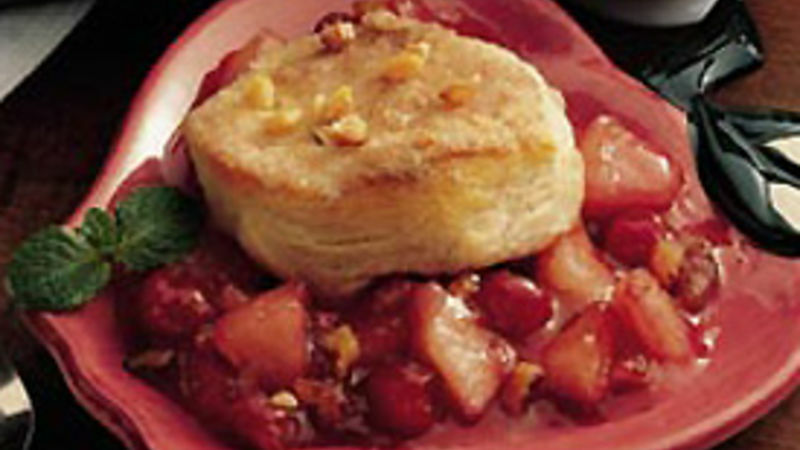 In large saucepan, combine apples, cranberries and water; cook over medium heat for 5 minutes. In small bowl, combine 1 1/4 cups sugar, 1/2 cup nuts, cornstarch, salt and 1/4 teaspoon cinnamon. Stir into apple mixture; cook 2 to 4 minutes or until thickened. Pour into ungreased 13x9-inch pan. Separate dough into 10 biscuits. Separate each biscuit into 2 layers. In another small bowl, combine 1/4 cup sugar and 1/2 teaspoon cinnamon. Dip one side of each biscuit in melted butter, then in sugar mixture. Arrange biscuits, sugared side up, over hot apple mixture, overlapping to make 2 rows. Sprinkle with 1/4 cup nuts. Bake at 400°F. for 20 to 25 minutes or until deep golden brown. If desired, serve warm with cream or ice cream.